The Extended Euclidean Algorithm finds a linear combination of m and n equal to . I'll begin by reviewing the Euclidean algorithm, on which the extended algorithm is based. 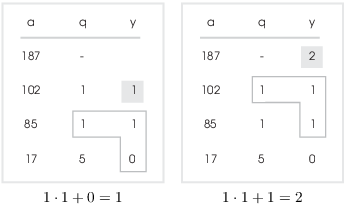 The inequality shows that the 's form a decreasing sequence of nonnegative integers. It follows that the algorithm must terminate. 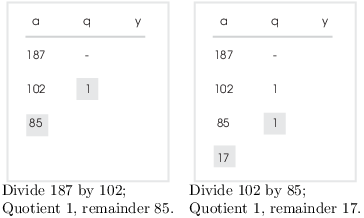 The greatest common divisor is the last nonzero remainder: . 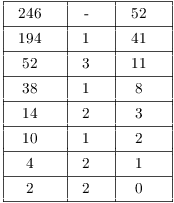 According to an earlier result, the greatest common divisor 29 must be a linear combination . Here's a tedious way to find integers a and b which work. Simply work backwards through the equations above, treating the 's as if they were variables. I've written the greatest common divisor 29 as a linear combination of the original numbers 1914 and 899. While you can use this back-substitution approach to write the greatest common divisor as a linear combination of the original numbers, it's rather tedious. Here's a better way. I'll write it more formally, since the steps are a little complicated. I proved the next result earlier, but the proof below will actually give an algorithm which constructs a linear combination. It is called a backward recurrence, and is due to S. P. Glasby . It will look a little complicated, but you'll see that it's really easy to use in practice. Warning: s and t are not unique. Proof. is only defined if at least one of a, b is nonzero. If , and . This proves the result if one of the numbers is 0, so I may as well assume both are nonzero. Moreover, since , I can assume both numbers are positive. I will prove this by downward induction, starting with and working downward to . The result holds for . Next, suppose . Suppose the result holds for , i.e. This proves the result for k, so the result holds for , by downward induction. Since , I've expressed as a linear combination of and . There are many algorithms (like the one in the proof) which produce a linear combination, but I'll call this one the Extended Euclidean Algorithm. Example. 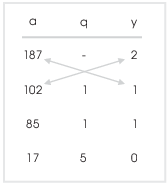 Compute and express it as a linear combination of 187 and 102. I'll arrange this computation in the form of a table; it's just an extension of the table I used for the Euclidean algorithm. 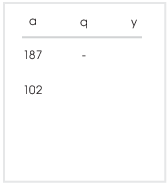 The a and q columns are filled in using the Euclidean algorithm, i.e. by successive division: Divide the next-to-the-last a by the last a. 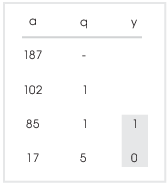 The quotient goes into the q-column, and the remainder goes into the a-column. When the division comes out evenly, you stop. In this case, 85 divided by 17 is 5, with remainder 0. The last entry in the a-column is the greatest common divisor. Thus, . 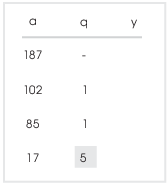 The y-column is filled in from bottom to top. Always start with 0 for the last y and 1 for the next-to-the-last y. This way, you don't need to memorize the exact formula. Example. Compute and express it as a linear combination of 246 and 194. I think this algorithm is the best for hand computation. For implementation on a computer, it has a drawback: You need to store all the Euclidean algorithm quotients, because you need to work your way backward up the table. There is another version of this algorithm which only requires that you save a couple of table lines at a time; it is not as good for hand computation, since you need two helper variables x and y and two multiplications at each step. 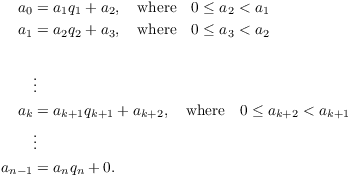 S. P. Glasby, Extended Euclid's algorithm via backward recurrence relations, Mathematics Magazine, 72(3)(1999), 228--230.